Nestled between the towns of St. Helena and Rutherford, our Home of the Week celebrates good living. 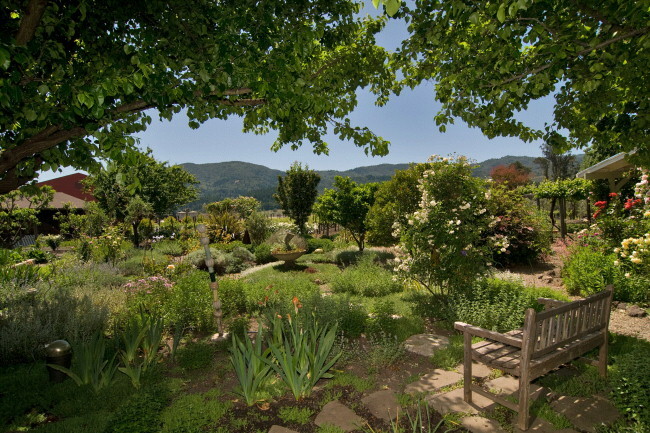 Enjoy views of hills and vines, and taste from the garden’s peach, fig, plum, pluot, pomegranate, persimmon, and citrus trees. Capture a moment’s inspiration in art with the ceramics and painting studios. Ready for company with a picnic area and guest cottage, this home for sale in Napa county offers a relaxing gathering place for friends and family. From views and vines to guests and gardens, our Home of the Week will help you live the good life. See more details and photos from 1691 St. Helena Hwy.